Although young children need adult supervision anywhere, especially where pools are concerned, we trust that many of our villas are more suitable for families with small children. These are villas built in peaceful areas away from main roads and traffic. But we have also noticed that many villas due to their position have gardens that are not completely enclosed and often they will open onto countryside. Sardinian Villas would like to assist you in choosing the right villa and will be able to give you personal advice about each individual property, as some villas may be more appropriate for older or younger children. Many of our villas come with cots and high chairs! Sleeps 12. A luxury and modern villa on secluded beach, 18 km South of Olbia Airport. Directly on secluded sandy cove! Sleeps 5. A villa 30 m to beach with shallow water! Perfect for children to play! Air conditioning. Wi-fi. This charming cottage has been refurbished with style and comfort in mind. Gorgeous sea views, it faces a landscape of wild unblemished beauty. Restaurants, bars, mini-market and water sports are all to be found within easy walking distance. 30 m to secluded beach. Large Olympic Swimming pool for older kids. Pizzeria and small shops all walking distance. .
Tucked away amongst peaceful lush Mediterranean gardens in a quiet and family-friendly residence alongside a coastline of silent sandy coves and a beach perfect for children. Olympic Swimming pool and pizzeria on location. It is approx. 20 min drive from the charming historic citadel of Alghero, which has surely the most characteristic and picturesque old town in Sardinia. A maze of narrow cobbled lanes and small squares with typical Mediterranean cafes opening their terraces onto the old squares with shady sitting corners and the relaxing atmosphere one loves in this old traditional towns which come alive in summer! Facing a beach with shallow water and fine sand! Stintino, near Alghero. Sleeps 4. A small villa facing one of the nicest beaches of Sardinia in Stintino. The white sandy beach La Pelosa can simply be reached by crossing the road. Beautiful sea views. Sleeps 4. Fully restored old barn on Alghero's coastline. A/C. Large garden for kids to play! Near Santa Teresa di Gallura. Sleeps 10. Large garden for kids to play! 80 m to beach. With fenced swimming pool, walk to beach! 40km from Cagliari. Sleeps 8. Close to shops and restaurants. Dazzling sea views twinned with a private swimming pool, various sheltered outside areas ideal for dining al fresco, sunbathing and lounging. Villa Stella is just a stroll from the fine sandy beach. Directly on the beach! This villa can now also be rented as 3 separate units, 3 apartments each with 2 bedrooms with large terraces and charming views! Or the whole villa! South Sardinia. Sleeps 13+2. Wi-Fi. Eco-friendly! In South Sardinia. 6 cottages. Short walk away from sandy beaches. 40km from Cagliari. Sleeps 6/8. Air conditioning. A very charming villa with direct access to the sandy beach from its lush garden. A playground on site to offer fun moments to our youngest guests! Shared swimming pool and good family restaurant for an easy and relaxing stay! South Sardinia. Sleeps 13/14. Direct access to a sandy beach. A most charming villa with direct access to a sandy beach of soft sand so typical of Sardinia. The position of the villa is second to none as actually access to beach is private and exclusive. 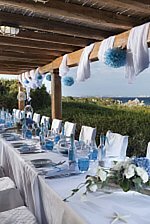 Above the beach, a large shady gazebo with wooden platform is set up for unforgettable evenings, candle lit suppers facing the sea!